Also serving communities of Newville, Mifflintown, Mc Alisterville. There are 14 Assisted Living Facilities in the Carlisle area, with 4 in Carlisle and 10 nearby. To help you with your search, browse the 68 reviews below for assisted living facilities in Carlisle. On average, consumers rate assisted living in Carlisle 4.1 out of 5 stars. Better rated regions include Harrisburg with an average rating of 4.3 out of 5 stars. Caring.com has helped thousands of families find high-quality senior care. To speak with one of our Family Advisors about assisted living options and costs in Carlisle, call (855) 863-8283. Carlisle, Pa., is a small borough located in Cumberland County. It's known as the automotive capital of Pennsylvania and hosts numerous car shows each year that sometimes draw more than a half million visitors. Over 15 percent of the population in Carlisle is made up of senior citizens. The Carlisle area is home to 22 assisted living residences. Four are located in Carlisle while the remaining 18 are located in surrounding communities such as Mechanicsburg, Harrisburg and Camp Hill. Assisted living residences in Pennsylvania are regulated by the Department of Aging, Office of Long Term Living. The cost of living in Carlisle is nearly 6 percent lower than the U.S. national average. Lower prices on expenses such as health care and prescription medications will allow seniors to use the savings toward the cost of assisted living. The Carlisle area is home to world-class medical facilities, including UPMC Pinnacle Carlisle, in case of medical emergencies or illness. Pennsylvania is tax-friendly toward seniors and doesn't deduct income tax from social security income. Property crime rates are slightly higher in Carlisle than the national median. There are 26.09 reports of property crime for every 1,000 residents in Carlisle, while the national average is only 25. Seniors living in Carlisle may wish to take extra caution when it comes to protecting their assets. Carlisle sees above average amounts of both rain and snow. National yearly averages are 39 inches of rain and 26 inches of snow per year, while Carlisle's average is 42 inches of rain and 28 inches of snow. Seniors who are fond of outdoor living may find the climate to be unpleasant and inconvenient. The Carlisle area has an array of community resources for seniors, including Rabbit Transit's Shared Ride program, which offers consolidated routes to locations not served by fixed public transportation routes, as well as six senior centers. Assisted Living costs in Carlisle start around $0 per month on average, while the nationwide average cost of assisted living is $4,000 per month, according to the latest figures from Genworth’s Cost of Care Survey. It’s important to note that assisted living rates in Carlisle and the surrounding suburbs can vary widely based on factors such as location, the level of care needed, apartment size and the types of amenities offered at each community. 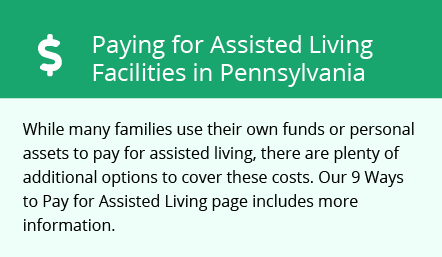 There are no Medicaid programs for seniors that help pay for the cost of services provided by assisted living residences in Pennsylvania. Residents who receive Supplemental Security Income (SSI) may be eligible for additional funding from the state to pay for the cost of room and board. Assisted living residences may not charge seniors who receive SSI more than their monthly income less a personal needs allowance. Family supplementation is permitted provided it's paid directly to the residence. Carlisle and the surrounding area are home to numerous government agencies and non-profit organizations offering help for seniors searching for or currently residing in an assisted living community. These organizations can also provide assistance in a number of other eldercare services such as geriatric care management, elder law advice, estate planning, finding home care and health and wellness programs. To see a list of free assisted living resources in Carlisle, please visit our Assisted Living in Pennsylvania page. Carlisle-area assisted living communities must adhere to the comprehensive set of state laws and regulations that all assisted living communities in Pennsylvania are required to follow. Visit our Assisted Living in Pennsylvania page for more information about these laws.